Opening today in San Diego's Convoy District of Kearny Mesa is J/Wata Temaki Bar, a Japanese hand-rolled sushi concept from the owner of neighboring RakiRaki & Pokirrito restaurants. Junya Watanabe is slowly taking over the complex at 4646 Convoy Street in Kearny Mesa. 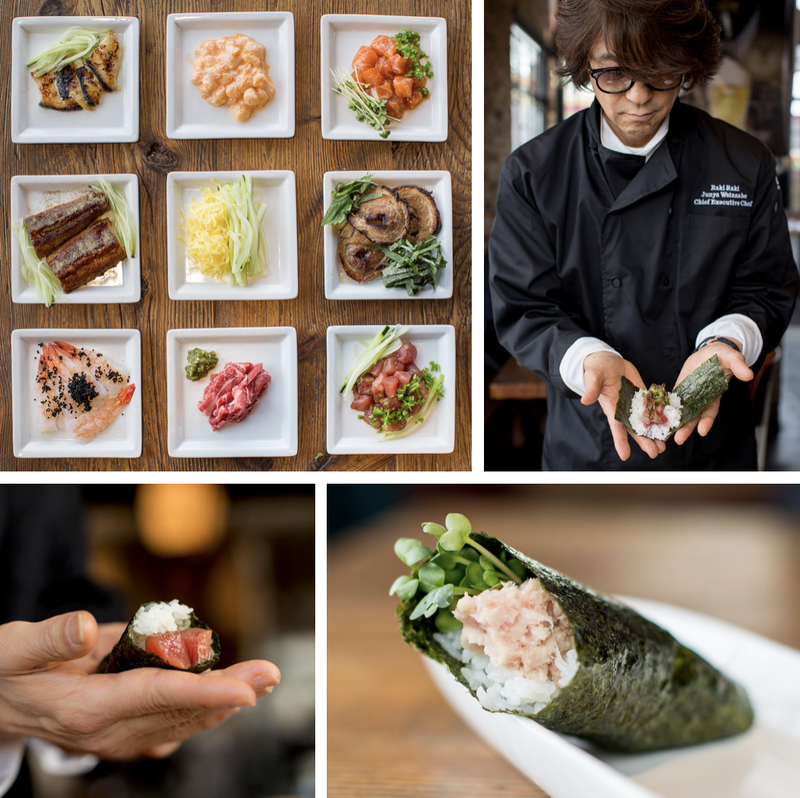 Adding to his three other concepts sited in the small strip mall (Rakiraki Ramen, Pokirrito, and Angels & Hearts Creperie) is J/Wata Temaki Bar, a quaint 1,500 square foot sushi restaurant dedicated to the art of temaki, or cone-shaped sushi hand rolls. Designed to be similar to Watanbe's sushi bar in Japan, the 22-seat restaurant has a central, rectangular sushi bar surrounded by walls decorated with Japanese anime murals. J/Wata serves a menu of nori-wrapped sushi rolls hand made to order. Fillings for the rolls include blue crab, spicy toro, salmon, Wagyu beef, bay scallops, Maine lobster and more. The restaurant also serves appetizers like salmon sashimi and tsukemono assorted preserved vegetable, as well as drinks like green tea, soda, bottle beer, wine by the glass and sake. In addition to overseeing more locations of his RakiRaki Ramen & Tsukemen and Pokiritto concepts in Little Italy and Liberty Station, Junya Watanabe is also working on launching a yet-to-be-named concept in Liberty Public Market's Mess Hall. The new eatery is expected to bring a bold fusion of Korean and Mexican flavors to guests starting this Summer. J/Wata is now open starting at 5pm during the week and 11am on weekends. The eatery will begin daily lunch service in the coming weeks. For more information, visit j-wata.com.